In early 2015 I built an awesome standing desk + treadmill combo. You can read more about that here. 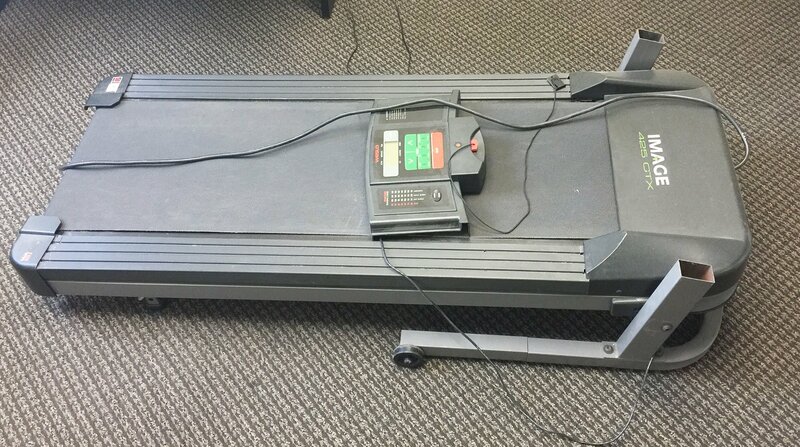 Anyway, I got good use out of it but I can’t take this to our new office space, so I’m giving the treadmill part of that combo for free to the first person who can haul it out of our office by Friday 4/14/2017. NOTE: There are building restrictions when larger items can be moved. Also larger items are to only to be moved via the freight elevator. Best to check with Kayla about the timings (ask me for contact info). It’s recommended that you park your pickup on the top floor of the attached parking structure, walk via the overhead bridge and take the elevator from ‘bridge’ / floor 2 to floor 4. This is how it could be setup. The Thread Mill stuff is circled in red. The desk I used is the now discontinued Ikea Jerker. Craigslist may have them for under $100 too. Disclaimer: It’s in good working condition but is being ‘sold’ as-is. Like with any exercise equipment, you’re responsible for safety. Don’t blame me if it ruins your life, causes death/injury or results in frogs raining from the sky.